Instadebit (www.instadebit.com) is an online electronic wallet system, available to all Canadians who bank with a Canadian financial institution. Similarly to other online e-wallet payment systems, Instadebit allows users to attach one verified bank account, which they can then use to either fund their Instadebit Canada account or use directly through Instadebit to pay for online purchases. 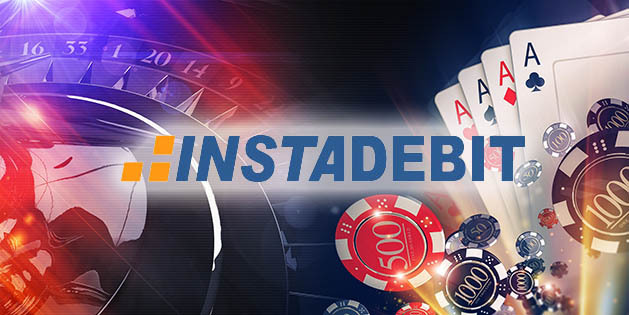 Instadebit is affiliated with thousands of online merchants including many online Canadian casinos, which makes it a very secure banking option for those who do not want to deposit funds via a prepaid option. Setting up an account with Instadebit can be done either as a pre-approved action, or when you go to make an online purchase using the instadebit payment option. In order to sign up, you need to be able to provide some of your basic information like the name, address and preferred e-mail. You will also need to provide such data as your birth date, information about your bank account and the last 4 SIN card’s digits (which is Social Insurance Number). The birth date is used for verifying that you are of full legal age (which is 18) and will be used to confirm your identity. The bank information needed is 5 digits of the transit number, 3 digits of the financial institution number and the account number (no more than 12 digits). These can be found on personal cheques (void or not) or can be obtained via a teller at your local branch. Once your account is created, you will have a limited spending amount until your bank is verified. Keep in mind that when choosing which bank account to attach, you can only attach one to your Instadebit account. There is no way to split payments between different accounts. To verify your bank account, Instadebit will make a deposit of some small sum of money to your attached bank account. Once this shows up in your bank account, you will need to verify the amount. To do this, log in to your Instadebit account and click on the “verify bank account” from the top right navigation menu. Enter the deposit amount you received and hit submit. Casinos that accept Instadebit are almost all of the top online casinos, including Jackpot City, Ruby Fortune, and Spin Palace. Now there are no fees associated with using your Instadebit account, however, if you choose to pay to an online merchant, like an online casino, from your bank account through Instadebit, there is a $1.95 CAD charge. Likewise, if a merchant transfers you funds, there will be no charge for receiving the funds into your Instadebit account balance, but as for withdrawing these funds to your bank account, you ought to pay $2.00 CAD for that. It also takes 3-5 business days to receive funds to your bank account from the Instadebit one. Now Instadebit does deal in USD and CAD currencies, so you can make payments to online merchants in both currencies. If you make a USD transaction, but only have CAD funds available, then you will be able to see how much that total amount is in Canadian dollars on your transaction receipt. If an exchange is needed between currencies, regardless of whether you are making a payment or withdrawing funds, then a fee will be taken to compensate for the currency risk involved. If you receive funds in USD to your account balance, then they will remain in USD until you either withdraw them or exchange it into CAD currency. So keep it in mind when choosing your Instadebit casino. Also remember that in order to withdraw funds from an online casino to your Insta debit account, you will first need to deposit into the casino using Instadebit.